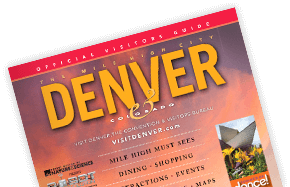 Beyond the big-ticket attractions, Denver is home to a wide array of smaller, but no-less-fascinating attractions that make for unforgettable experiences. Denverite Molly Brown&apos;s name is known around the world as a Titanic survivor, thanks to stage productions, classic films and blockbuster historical dramas. But that&apos;s just the tip of the iceberg when it comes to this "unsinkable" woman. The Molly Brown House Museum tells her story, and stands as an enduring symbol of the Victorian era and the city of Denver. Called "Denver&apos;s most interesting museum" by the Denver Post, The Kirkland Museum of Fine & Decorative Art showcases the work of Colorado&apos;s distinguished painter, Vance Kirkland (1904-1981), whose visionary abstract paintings influenced an entire generation of artists. The museum is also filled to the brim with Colorado and regional art and more than 3,500 works of Arts & Crafts, Art Nouveau, Glasgow Style, Wiener Werkstätte, De Stijl, Bauhaus, Art Deco, Modern, Pop Art and Postmodern. The Black American West Museum highlights the prominent role Blacks played in the settlement of Colorado as miners, soldiers, homesteaders, schoolteachers, ranchers, blacksmiths, cowboys and lawmen. This unique museum, located in the former home of Colorado&apos;s first Black woman doctor, hosts countless photographs, artifacts and interactive exhibits that tell the story of the Wild West through a different lens. The only museum in the region devoted exclusively to Latino culture, collecting, preserving, and interpreting the art, history, and cultures of the Americas from ancient times to the present. Located in the heart of Denver&apos;s Art District on Santa Fe, the Museo de las Americas was founded in 1991 and boasts an ever-changing selection of exhibits, not to mention a wide array of educational offerings. "Anything on wheels" is the Forney Museum of Transportation&apos;s motto, and the museum boasts a one-of-a-kind collection of more than 500 exhibits relating to historical transportation. Highlights include Big Boy, the world&apos;s largest steam locomotive, legendary aviator Amelia Earhart&apos;s Gold Bug Kissel and a rare 1916 Detroit Electric Opera Coupe, one of the world&apos;s first electric cars. A Denver original, fashion pioneer and CEO of Rockmount Ranch Wear, Papa Jack Weil - who passed away in 2008 at the grand old age of 107 - invented the western snap-button shirt and opened shop back in 1946. He sold his shirts to presidents and rock stars alike, including Eric Clapton and Bruce Springsteen. Stop by the flagship store and museum to browse the incredible selection of Western-style shirts, hats and accessories. After then-unheard of construction costs of $1.6 million, downtown Denver&apos;s Brown Palace opened its doors on August 12th, 1892 - and hasn&apos;t closed them for a single moment since. This luxurious four-star hotel remains one of the city&apos;s crown jewels today with its stunning stained glass atrium lobby, extravagant suites and four extraordinary dining venues. One of Denver&apos;s great historic homes, built in 1883 by Rocky Mountain News publisher Williams Byers and sold in 1889 to the family of William Gray Evans, an officer of the Denver Tramway Company, the Center for Colorado Women’s History at Byers-Evans House Museum offers keen insight into the early days of Denver. Guided tours take visitors through the elegant residence, richly filled with original Evans family furnishings. Located in a 150,000-square-foot 1930s-era former Air Force hangar, Wings Over the Rockies is heaven for the aerospace enthusiast. The museum is home to more than three-dozen historic airplanes and space vehicles, including a massive B-52 Stratofortress, a 1926 Eaglerock "longwing," and - Star Wars fans take note - an X-Wing fighter. There&apos;s nowhere else you&apos;re going to see a pair of inflatable, 16-foot-tall rubber bunnies, right? One of the Mile High City&apos;s most fascinating art locales, The Dikeou Collection is a private collection of contemporary art, with photography, drawings, sculptures, and installations by more than 25 artists from around the world. Free and open to the public, Wednesdays, Thursdays and Fridays, 11 a.m. to 5 p.m. or by appointment.